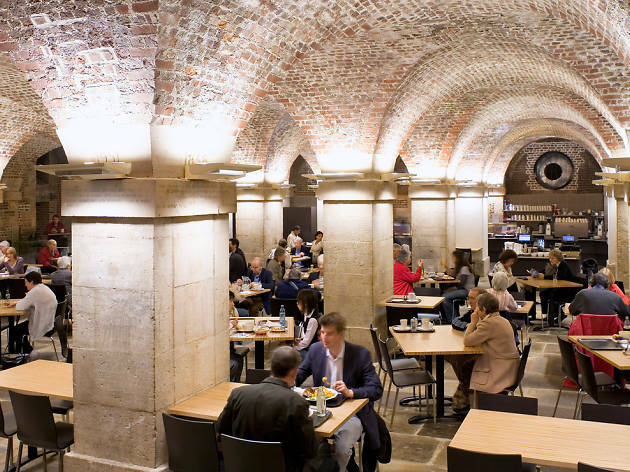 A subterranean café underneath St-Martin-in-the-Fields (the church on Trafalgar Square), the setting here is certainly atmospheric – expect brick vaulted ceilings and tombstones beneath your feet. The food menu goes from traditional English breakfasts and scrambled eggs on toast to sandwiches and soups at lunch, afternoon tea and a daily-changing mains that might include options such as shepherd's pie, mince beef wellington or a spinach and feta filo bake. There's also a salad counter and special menus on Fridays and Sundays. Keep an eye out for live jazz nights, too. They have a generous display of great hot dishes, salads,desserts and refreshments. I highly recommend their apple crumble and custard, if you have a sweet tooth. The prices are very reasonable, great for a quick bite. Apparently there's have live jazz on Wednesdays! 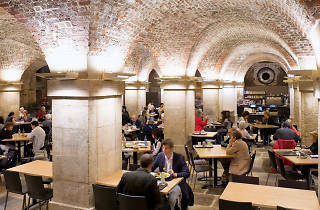 Once you are downstairs you will be in a large atmospheric crypt with beautiful arched vaulted ceilings. The acoustics are great, even when it is full you can hear your party's conversation without difficulty. The floor is flagged with large stones and some very old gravestones. What a good find. Excellent food, nice vegetarian option. Reasonable prices. Nice for cake or coffee too. A great hidden find.